An annual study conducted by The Bridge Group in 2017 asked respondents to identify their top challenges in managing sales reps. The responses revealed that improving sales productivity and performance has remained the #1 challenge. Not only has it remained the number one challenge for the last six years and counting, the number of respondents reporting it as their greatest obstacle has increased 5%. In 2012, 44% of organizations claimed that increasing sales productivity was the toughest hurdle they faced. As of 2017, that number now sits at 49%. Proving what an overwhelming challenge getting the most out of your sales team truly is. When you consider the nature of field sales, this shouldn’t come as much of a shock. The average outside sales rep typically only spends 22% of their time actively selling. The challenge of increasing salesman productivity is a taller task than ever before with the amount of additional tasks and distractions getting in the way of actual selling. Another study conducted by Pace Productivity brought to light an interesting response they received from managers. When asked, managers said they expected salespeople to spend at least 50% of their time selling. There’s clearly a disconnect between the expectations that are being set and the time commitment required. Sales reps are already working an average of 49.6 hours per week, just slightly less than their managers who work an average of 50.1 hours per week. Improving sales productivity starts with understanding that it’s not for a lack of effort. They’re working, just not only on selling – 23% more of a salesperson’s time is spent on administrative tasks than selling. 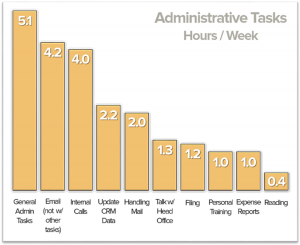 There are a million different strategies you could use to increase sales productivity, but reducing administrative tasks should probably be the first place you start. What Is Sales Productivity, Really? Sales productivity can be summarized as maximizing sales results while reducing the resources expended. Resources can include anything from cost to effort to time. Sales productivity can be measured by the rate at which a salesperson increases revenue for the company. In short, improving efficiency comes down to finding ways to become more efficient with your time. Adding structure and focus to their day allows them keep the end goal in mind. Field sales professionals face an overwhelming number of obstacles preventing them from operating at peak efficiency. Before understanding how to coach and structure your sales team to achieve optimal levels of productivity, it’s important to recognize and understand the most significant factors standing in the way of reaching greatness. This list could go on forever. The factors that prohibit salespeople from taking advantage of their entire work day can be big or small. Regardless of severity only one thing is for sure, every member on your sales team will encounter several of these challenges. In a landscape that’s more competitive than ever, the margin for error is slim to none. With such a large number of hurdles standing in the way of an efficient sales team, there are a few key pillars that serve as the foundational building blocks to help increase sales productivity. Some may be staring you right in the face while others aren’t necessarily on the surface. A firm organizational sales structure is an essential component of consistency. There may be wrinkles unique to each salesperson, but the same sales process should always be followed. How a sales rep’s day is scheduled and structured goes a long way as well. Use what works and share those strategies with the entire team. The number of distractions pulling us away from our daily goals seem to only ever increase. It doesn’t help that today’s generation has an extremely short attention span on top of that. Eliminate the things that take you away from your present focus or build a specific time for these tasks in your daily schedule. The majority of field sales managers will tell you that things are “really good” and “going well” when asked, purely out of natural instinct. These answers are the epitome of mediocrity. While it may be more than lip-service, are their sales tools and processes as effective and efficient as they could be, or as their competitors? Holding onto what’s working isn’t necessarily “bad,” but it prevents progress. The field sales industry changes at such a rapid rate, and refusing to innovate significantly hinders salesman productivity. Need some inspiration? Nobody embraced innovation better than the driving force behind the infamous 1980 Miracle On Ice, head coach Herb Brooks. He was doing “pretty good” prior to the Olympics, leading the University of Minnesota to 3 NCAA D-I Championships in 1974, 1976 and 1979. Brooks is notorious for his approach, forcing 20 hated rival college kids to learn a new, untested style of play. Brooks’ hybrid combined the Soviet Union’s fluid, weaving attack with the physical defensive style seen in the NHL. The competitive nature of the field sales landscape leads sales reps and their managers to feel the added pressure to perform and attain their quotas. Even the best sales professionals are bound to have an off-month. Low performance exacerbates the rush achieve their targets. Salespeople taking the initiative to perform at a higher rate is a positive takeaway, but it’s this type of pressure than can actually have a negative effect on productivity levels. Additionally, re-evaluate your sales quotas to ensure they’re challenging, yet attainable. Quotas that salespeople perceive as being impossible to reach are likely to prevent your staff from trying because they believe they’re going to fail regardless. A 2017 report by CITE Research surveyed over 400 sales executives with a director-level title or above, and found that the majority of respondents rely on an average of 11 sales tools. Of those tools, CRM platforms were rated as the #1 “most valuable tool in increasing the effectiveness of a sales team,” scoring a 4.6 out of 5. This is due to the fact that a CRM significantly reduces the amount of time spent on redundant tasks like data entry, freeing them up to focus generating revenue. One way to utilize automation tools to increase sales productivity is through triggered events; which are exceptionally beneficial when it comes to things like follow-up emails. The trigger allows reps to respond faster while doing less work. Companies following a defined workflow are 33% more likely to be high performers. In order to start improving sales productivity, you have to know where you currently stand. Dashboards are incredible for this purpose. They help you visualize trends to gain valuable insights into each salesperson’s activity-based metrics. The 5 must know metrics for field sales managers will show you exactly where your team is spending the majority of their time. The key to measuring activity-based metrics is consistency. If you allow your team to slack at logging their sales activities, you won’t be able to establish a benchmark to measure your productivity gains against. If Joe averages 5 minutes between each logged activity and Sam averages 15 minutes, you have the data to determine the root of the problem. Collecting and analyzing the proper data can quickly uncover opportunities for improvement. Determining a sales rep’s productivity level extends well beyond dollars and cents. Measuring productivity can be done in multiple ways, most of which can be combined for a more accurate benchmark. The methods below may be more beneficial for you compared to simply measuring revenue per sale, depending on your sales team’s daily tasks and activities. The number of attempts and contacts a sales rep makes is great to measure activity levels, but there are better KPI’s to help increase sales productivity. Your conversion rate is the percentage of prospective customers who complete a specific action, most commonly making a purchase. The target range will vary for each company depending on the type of sale. Conversion rates provide insight into how well a sales rep is performing. Closing 10 sales per month in some companies is phenomenal. For companies that are transaction-based, 10 deals might not be so hot. The number of deals pushed through is also dependent on how many sales activities were completed. A sales rep who burns through 50 leads to close 10 accounts is extremely inefficient compared to the rest of your team that is averaging 20 leads for the same number of sales. However, keep in mind that these rates are not universal. In some businesses, closing a single deal out of a hundred is already considered a success, while in another, a 1% conversion is a proof that something isn’t working. Knowing how efficient your team’s sales performance is on an hourly basis is an important aspect for many businesses. To increase salesman productivity, focus your attention only on the time spent completing sales activities. Exclude anything that doesn’t actively work toward converting deals, like time spent preparing, company meetings, and administrative tasks. This is a great metric to help determine if your sales reps are making the most of the time they’re on the clock. If this number is below average, consider helping your team structure their day more effectively. Sales forecasting is a topic we’ll have to save for another day, so you’ll need to have a process for this already in place. Actual vs Forecasted is also commonly referred to as Mean Percentage Error (MPE), and is an extremely effective metric used to whether a sales rep is failing or exceeding their sales targets. MPE provides an exact deviation from the target to help you determine whether you could increase sales productivity by reworking a quota that seems impossible to reach or looking for holes in your sales process. Field sales reps typically have schedules that are slightly busier compared to their counterparts in inside sales. The key is to get things done. It doesn’t matter how you do it, as long as you do it. What works for one person may not necessarily work for another. That’s the beauty of field sales, there’s ample opportunity for flexibility and creativity. Improving sales productivity will require salespeople to organize their daily schedule. Once they’ve laid out what needs to be done, it’s about prioritizing those items. They should be encouraged to say no to things that don’t help them meet their ultimate objective. Sales productivity in the field demands a certain level of structure. All of their meetings need to start and end on time. This won’t always be possible due to the amount of travel, which puts them in a tough position trying to decide whether that meeting or event takes priority to start late and push everything else back, or reschedule it for another day to keep everything else on time. To prioritize, place significant and long-term clients at the top of your list to ensure they are receiving optimal service. New leads should be prioritized after your existing clients, because it is better to nurture your existing relationships for long-term growth. In my experience, productive scheduling manifests as something you develop on your own, then slowly evolve toward perfection. I think it’s easier, for example, to pack all my conference calls into a couple days and leave Fridays open for office work (unless I’m speaking at a sales conference). Rather than schedule the ideal day, many salespeople prefer to schedule by the week with specific tasks assigned to specific days: cold calling on Mondays, warm prospecting on Tuesdays, demos on Wednesdays, networking on Thursdays, and meeting with or calling clients on Fridays. Keep experimenting with your rhythm until you find something that works. All non-negotiables should go on your calendar. Whether you’re using Outlook, Salesforce, a paper planner, or an app on your device, you will need a calendar to keep you apprised of when you’re doing what — or you will eventually forget something important. Put all your commitments on your calendar, breaking your time down by 30-minute blocks. If your cold calls take two hours daily, be self-disciplined about sticking to the schedule you’ve laid out for yourself. Yes, unexpected things always arise, so continue to adjust as necessary without letting your schedule completely implode. If you need to prepare for a demo tomorrow, schedule it. This applies for exercise and family time as well — always include enough life in your work-life balance to make your work worthwhile. Several factors are essential to making sales: prospecting, preparation, and the actual pitch. Block time for all three during your day. For example, you may want to make cold calls early in the day (in-person and/or by phone) while you’re fresh. Then spend midday fulfilling requests from your calls, handling current customer needs, and preparing for tomorrow’s sales calls. Then spend the afternoon prospecting for the following day so you can get a jump on it in the morning. While it’s exciting to chase new business, always schedule time for nurturing. You must check in with existing clients on a regular basis and maintain your relationships with them. The real profit doesn’t come from the first sale — it’s in all the sales that come afterward — from the clients who already know and respect you. Show them you care about them, and they’ll take care of you. Respond to email and voicemail during your non-prospecting times. Empty your inboxes each time you check your email using my 6-D Information Management System™: discard, delegate, do, date, drawer, or deter. Setting goals is a simple and easy way to increase sales productivity because they serve as motivation. They give salespeople a sense of direction and a plan of action to hit their target. There’s only one thing that a sales rep controls no matter what: the number of attempts he or she makes each day. Follow the SMART guidelines to help to create a plan of action. Remember, the focus is on improving sales productivity. By focusing on these two areas you are going to force yourself or your team to take the necessary steps to reach your sales goals. The majority of companies have some degree of onboarding or training for new hires, but what they really seem to lack is any ongoing training. Aberdeen found that it takes more than 7 months totaling upwards of nearly $30,000 to fully onboard new hires. They also revealed almost 87% of that training is forgotten in just a few short weeks. To effectively increase sales rep productivity, information should be tailored in a way that can easily be remembered. The more complex the product and process, the more important it becomes to present the information in a way new sales reps can relate to. Ongoing training is just as important as onboarding. Yet less than 45% of companies have a formal sales training process in place post-ramp. Equipping your team with the right skills to increase sales productivity should be as great of a focus as providing them with the right tools. Effective onboarding can reduce ramp-up time by 30 – 40%, and continuous training can lead to a 50% increase in net sales per rep. Your company sends information to potential customers at every stage of the buying journey. Follow that lead and do the same for your sales reps. On average, salespeople spend about 30% of their day looking for – or creating – content. This eats up a ton of their time and does nothing to help them be more efficient. Spend the time to learn about what their looking for and how you can help them if you want to make a considerable impact on their level of productivity. 95% of B2B deals are influenced by the content a company sends. Using sales enablement tooling to recommend content and messaging based on the sales situation saves reps time and helps them to accelerate deals. Communication is an essential skill for outside sales managers to possess. Schedules are much tougher to coordinate than they are for inside sales teams, leading to more interactions taking place over the phone and through text messages. To increase sales productivity, managers should check-in with each salesperson to get a pulse on how they’re feeling and performing. It’s even more important to have a high number of interactions with new hires going through their ramp up period. Check-ins don’t necessarily always need to be scheduled. In addition to checking in, it’s always a good idea to schedule to conduct in person one on one’s. The frequency may vary for each team, but the face to face setting should help promote a more in-depth interaction where training can be tailored specifically to that individual. One on one’s are the perfect opportunity to get feedback from your team to determine where there’s room for improvement. Chances are that if one person is struggling in an area, others are too. Always be sure to ask what you can do to help them become more productive. The more specific they can be, the better. An accountability network is one or more people who you hold yourself accountable to each week for getting things done, meeting your deadlines and achieving the goals you set yourself. Knowing you have to report to others is a natural deterrent to not getting things done. It’s easy to make excuses to yourself, but having to make excuses to peers as to why you didn’t accomplish what you were supposed to is much more difficult. So much more so that you will do everything in your power to avoid having to report less than optimal achievements. This is important because you don’t want sales working poor quality (unqualified) leads. A scoring framework is a methodology used by sales and marketing departments to determine the worthiness of leads by assigning values based on their behavior relating to their interest in products or services. The “value” of each lead is independent for each organization, but is characterized as the interest shown in the company or their places in the buying cycle. Batch work is a technique of grouping the same task together and not moving onto the next until everything in the current grouping is completed. For example, make 10 calls at once. Then do all of your data entry and follow-up work for those calls. This batching of activities is proven to be faster and more efficient than doing everything in a one off linear sequence. 2. Dive deep. Check out their site and learn about their mission. Research them on LinkedIn. Run a google search. Just make sure you have a holistic view of the organization: who they are AND what they do. 3. Find Their Pains. From what was learned in steps 1 and 2, you will be able to make an educated guess on their needs. Nothing revolutionary here, but it’s important to celebrate wins and hard work. This builds morale, keeps reps motivated, and makes the days exciting. Outreach helps you track, pace, analyze and automate your email and voice messages to your customers. By integrating Outreach into your CRM, you’ll never have to manually log your messaging activities and outcomes. MailChimp is the world’s leading marketing platform for small business. They democratize cutting-edge marketing technology for small businesses, creating innovative products that empower customers to grow. JobNimbus was developed with the cooperation of leading industry trainers and is the first CRM developed from the ground up to be an ultra simple, usable, yet powerful tool to help contractors take control of their jobs like never before. SPOTIO is a sales tracking and territory management app used by mobile sales teams to get organized, find more opportunities and dominate their marketplace. SPOTIO is perfect for door to door and field sales teams that want a powerful way to track their sales efforts and territories on a map driven interface. MarketSharp provides a way for remodelers to generate low cost leads, convert more leads into sales, and create lifetime customers who willingly give referrals and great online reviews. You’ll eliminate your daily struggles of running a business with the only remodeling software that is easy to set up, simple to understand, and time-saving. It’s critical to make the most of each day because there’s only so many in a year. When trying to find a way to get the most from your team, consider that happy and engaged employees are 31% more productive and have 37% higher sales numbers.